When the tomatoes are ripe there's nothing better! Everybody knows bruschetta by now. Most everybody in the US mispronounces it. The Italian “che” in this case produces a hard c, so the word is bru-ske’-ta, not bru-shetta. So now you know. The picture above shows the Roman version. You see, it’s just like Rome: colorful, disorganized, abundant, roughly chopped, and something you’ll just have to stick your fingers under to grab a piece because eating and other passions (like talking) involve your hands in Rome. You toast bread, preferably over an open hardwood fire. It’s Rome so you let it scorch a little. You cut a toe of garlic in half the long way and rub the bread with the cut side. You mix fresh chopped tomatoes with abundant olive oil the neighbor makes and just dump the the glimmering redness on top of the laid-out bread. Sprinkle with salt and you’re done. Optional is parsley or basil. 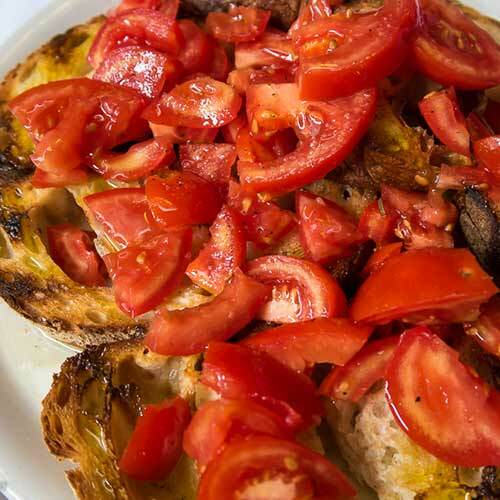 Bruschetta al pomodoro makes a great summer starter when you’re eating outside on a rickety table while letting Rome soak into your soul. You can get it all over Italy; tomatoes are said to be better in Campania, but the bread in Rome is perfect for the dish.